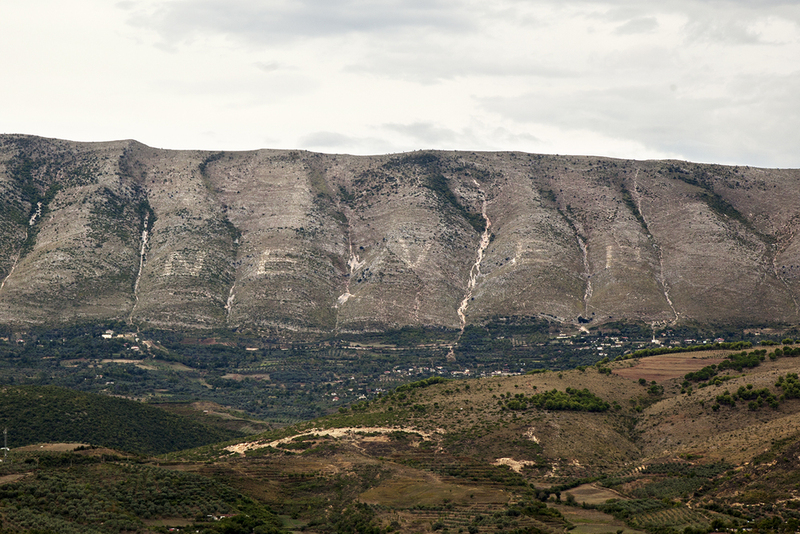 2012 - Albanian artist Armando Lulaj performs an act of taking control and subverting the previous understanding of the mounted slogan by rearranging its glyphs to reveal a new piece reading NEVER. These slogans, although legible from a distance, become obscured with a certain ambiguity among the glyphs as you near. The architecture reveals itself as white-painted stones, the symbol of propaganda. The project is characterized by the simple idea of retailing several of the original stones’ replicas that previously formed sign NEVER. 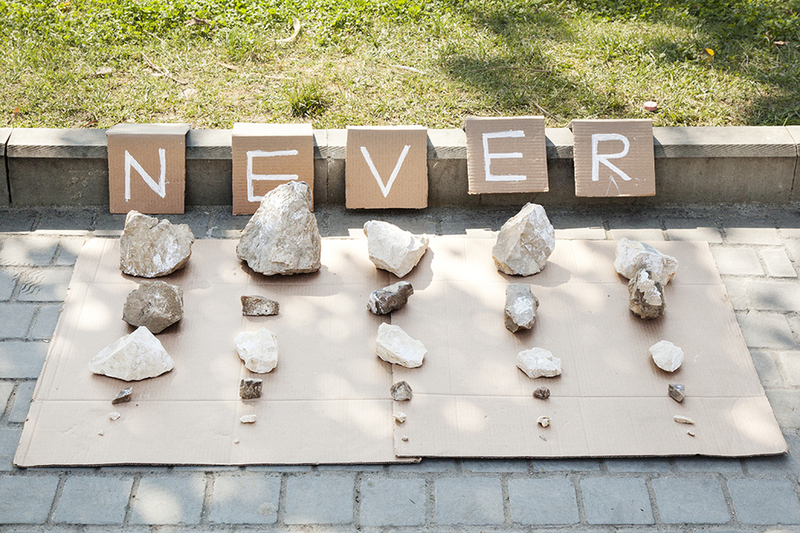 Every row of stones is an ideal copy of the material used for letters of the slogan. The cardboard banner easies its identification and the high prices punctuate its symbolic value. In effect this opens a platform for dialog on the underlying subjects of social values and cultural dynamics. 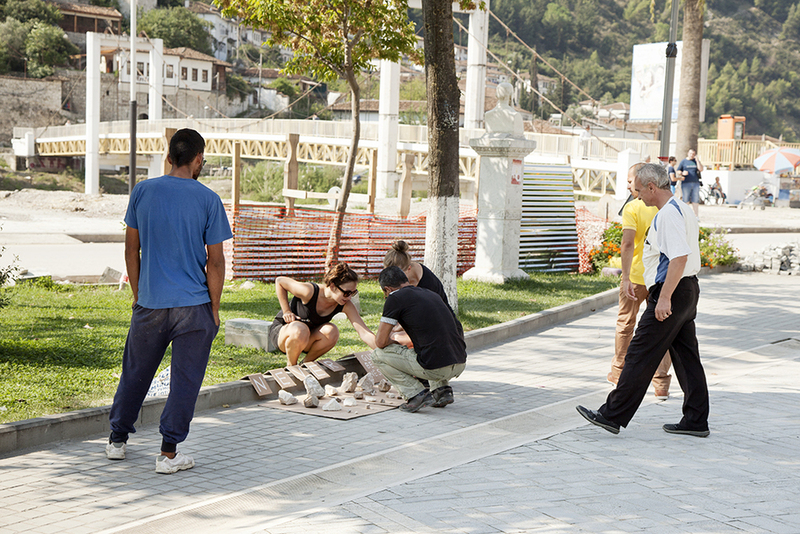 There tends to be an inherent formality, inscribed into the history of the people of the Albanian city of Berati; a polarizing division emerges among the residents as they impulsively compel the merchant to rearrange the characters on display to read as either NEVER or as ENVER. The capacity to be swayed by potential consumers permeates wherein lies a hidden capitalistic agenda charged with greed. Perhaps a stone would be purchased. Objects are like people – they have their biographies. Those can involve their social, political, and technical background, or substances from which an object was made. Like all biographies, those of an object also involve moments of breakthrough: both collapse as well as rebirth. Sometimes biographies of people and objects intersect, often intentionally. This happened in case of Anna Jochymek and Diana Lelonek. They entered the biography of a gigantic political slogan. They distorted its logic and interfered with its preceding course. However, their intention was not to destroy it, but rather to update it, to reflect upon it in a new way. 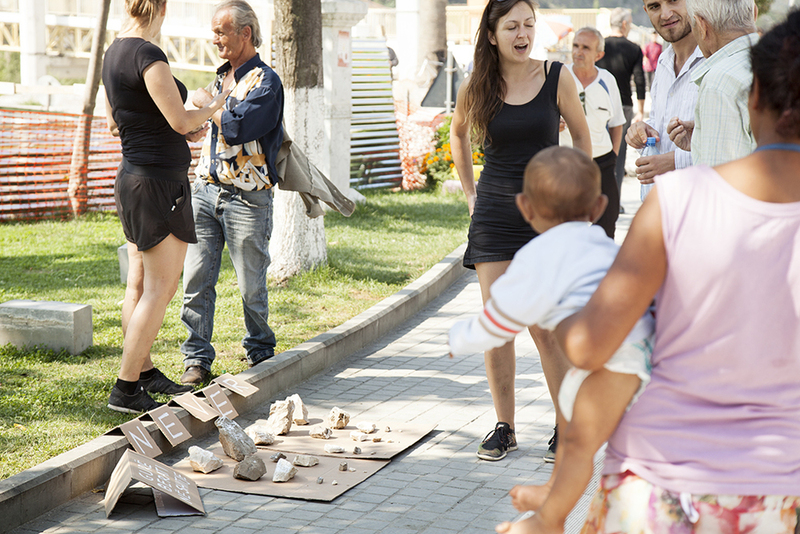 From the very outset, 'Berati stones' has been focused on interaction. Two women put particular objects on sale. 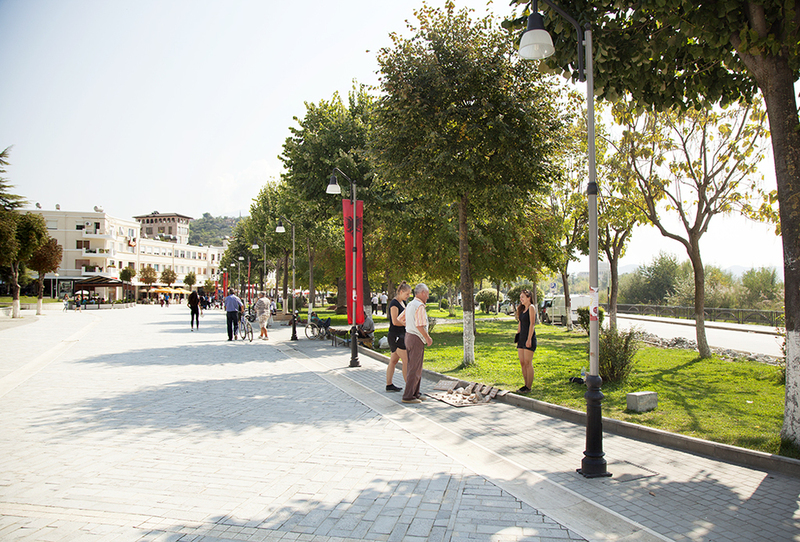 They displayed them on the city’s main promenade. They included captions and explanations. Against a background of a vast mountain of Shpirag, whose slope carried the sign 'Never', they presented stones taken from this sign. They were placed in a sequence following the order of the five letters. This way, they opened the space of encounter: with people as well as with the biography of the object. The space of encounter was soon filled with current emotions and memory of past events. 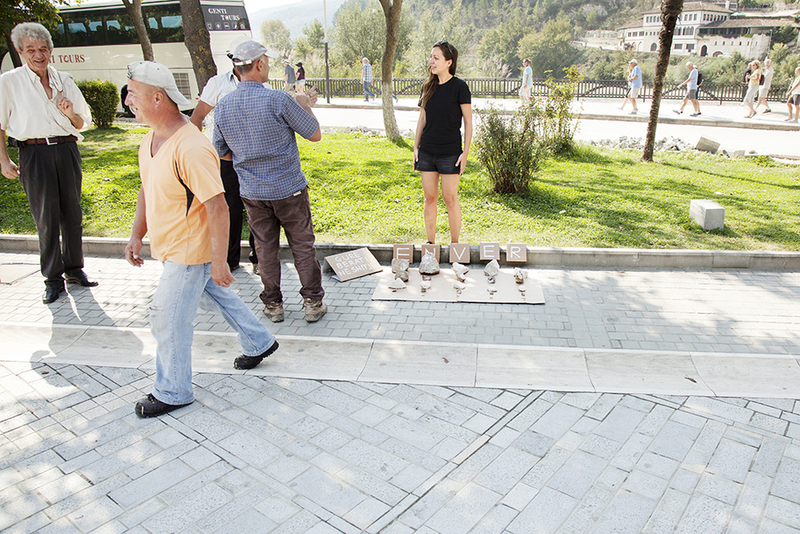 Passers-by examined the stones, weighed them in their hands, and posed questions. Most importantly, though, they manipulated with the meaning of the slogan written on five cardboard plates. The change of only one letter made NEVER turn into ENVER. There were many changes of this sort, in both directions. Rhetoric of his process went beyond its merely symbolic or visual aspect. The shift of letters was a shift within the system, which initiated a different kind of coding – memory, sensibility, as well as tangibility of cultural change. In this instance, it is quite insignificant that the stones on sale were only allegedly objects taken from the controversial place, that – as authors intended – they were ‘real replicas’. After all, social memory can easily be driven by mystification, while pride and shame eagerly draw from fiction. 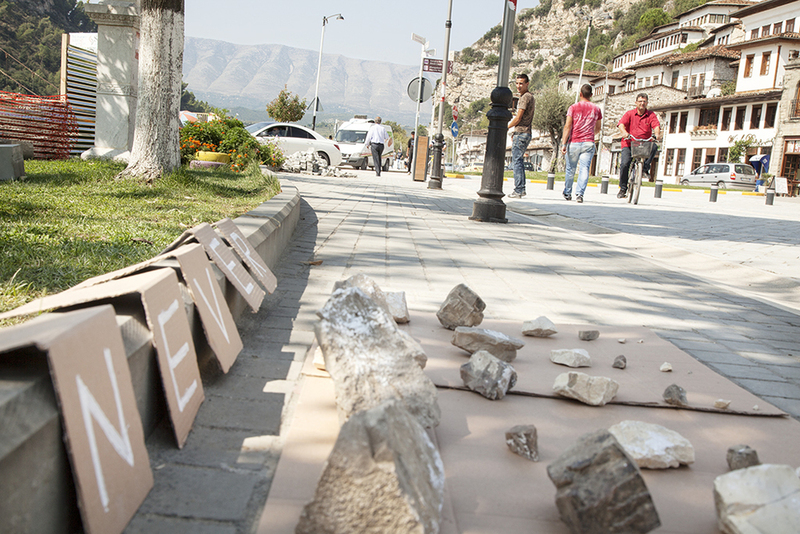 ‘Berati stones’ is fiction in the original sense of this term, which means creation, revelation of something. Jochymek and Lelonek engaged their ‘clients’ in an activity that ultimately formulated a new chapter in the object’s biography, whose history and scale were overwhelming for individual people. Offering small pieces of rocks they suggested that this history could be disenchanted and reduced to ordinary size. On the other hand, by allowing the participants to create the slogan themselves, they opened up a possibility of referring to personal experience and a sense of agency. In consequence, traumatic history and the scale of propaganda were overcome by individual people. They felt they could construct and deconstruct slogans, senses, and meanings. Even the largest ones.